The Trials & Tribulations of Planning. One month after my 1st trip planning post and we still have not booked anything. No air. No hotel. No Car. Are we even going? I have piles of maps and guidebooks. I’ve watched 3 travel videos. 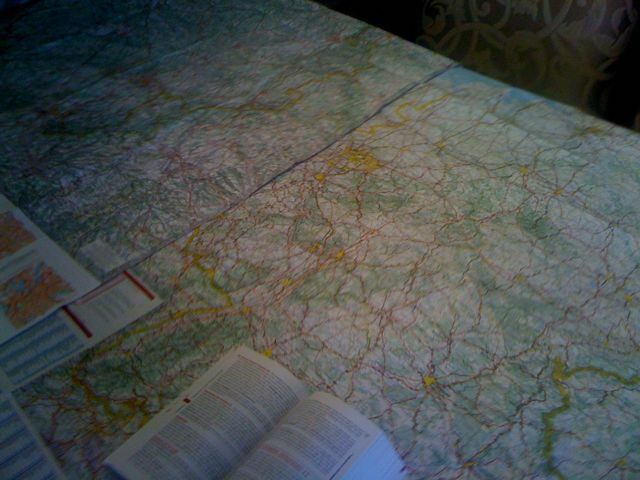 I can draw a map of our proposed route in my head, on a napkin, in my dreams… I’m conversant with hotel options in multiple countries… Today there were so many Firefox tabs open on cross checks and searches and maps I had to restart the computer. We’ve re-shifted dates. X-ed out the Rhine and the Black Forest as a stay-location. Now the current dilemma is how to get from the Mosel in Germany to Alto Adige in Italy while maximizing the exploration experience, squeezing in a day in the Rhine, an afternoon or morning at Legoland Germany and making sure we manage the Romantic Road *and* that we have to time see the famous Neuschwanstein Castle. Too much? Maybe. The big concern is that on a sight-seeing day we don’t park with luggage in the car. Now I challenge you to make a schedule that works! That is currently my lot. Then there’s the hotel perplexity. The hotel I want to go to after the Wachau is fully booked on certain days. So we have to land there on a certain night if we’re going to stay there. Generally my argument is that’s close to the Czech border and the train stations – making it ideal for a day trip to Prague. The weekend we’ve chosen to be in the Italian Alps is obviously a busy weekend which is also limiting our choices there. If we shift so we spend extra days to cover all the mid trip stuff we want to see then we end up not being able to stay at specific hotels (which are in excellent locations, like the one near Prague). There’s also a voice saying “you need to stay around in Italy longer”. But we have to get back by the 20th of May, preferably before. Meanwhile I’ve ruled out all the Amsterdam hotels I started with. The hotel in Belgium I wanted to stay at is booked the 3 days we want to stay there. If we use a Euro car rental we can drive to Italy but not the Czech Republic. We have a friend traveling in the Mosel & Wachau, so we’re trying to coordinate dates so that a winery visit might work in both locations. Of course there’s also the laundry factor which I won’t even get into. Shall I go on? Probably not. This is just not that interesting if you aren’t in the middle of it. Rest assured, some resolution will occur. I just hope it’s sooner than later. Next > We’re Going…but Where are We Going?